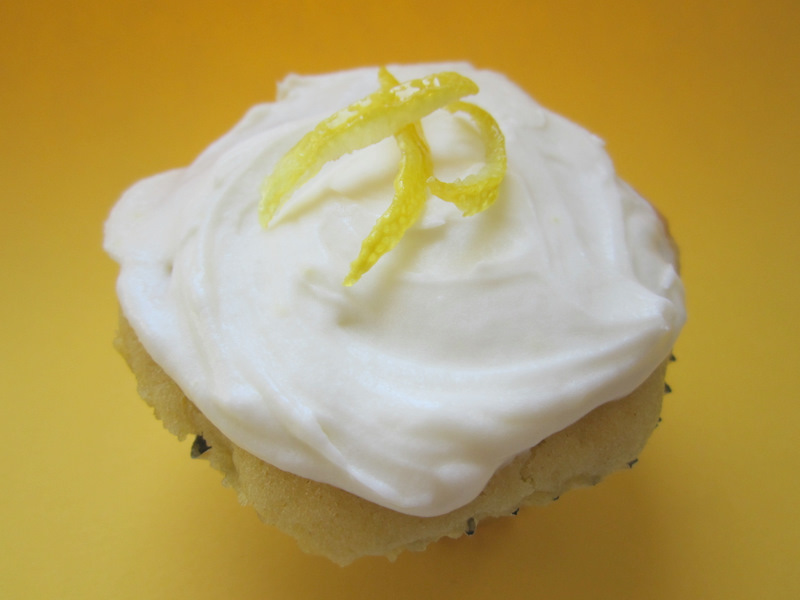 These lemon cupcakes were a nice refreshing change to the usual cupcake flavors I bake. The cake was soft and moist and the sweet tangy frosting was so addicting. I must admit I was a little sad when the last cupcake was gone. I could not get enough of these cupcakes! Next time, I’m definitely making the whole recipe instead of halving it. In a mixing bowl, cream butter and sugar. Beat in eggs, one at a time. Add lemon zest and vanilla; mix well. Combine dry ingredients; add to creamed mixture alternately with sour cream (batter will be thick). Fill greased or paper-lined muffin cups with 1/4 cup of batter. Bake at 350 degrees F for 25-30 minutes or until a toothpick inserted near the center comes out clean. Cool for 10 minutes; remove to wire racks to cool completely. For frosting, cream butter and sugar in a small mixing bowl. Add lemon juice, vanilla, lemon zest and milk; beat until smooth. Frost cupcakes.